Though less well known than, say, Dachau or Buchenwald, Gross-Rosen was also one of the main large concentration camps in what was then Nazi Germany. The memorial site is today on territory that ended up as part of Poland after WWII, namely near Wroclaw, the former German city of Breslau, in Lower Silesia. More background info: The camp at Gross-Rosen (spelled “Groß-Rosen” in the original German, Rogoźnica in Polish) was set up in August 1940, initially as a sub-camp of the longer-established Sachsenhausen camp near Berlin. But in May 1941 it was already turned into an autonomous concentration camp in its own right, i.e. with its own administration and its own system of sub-camps (nearly a hundred at one point). 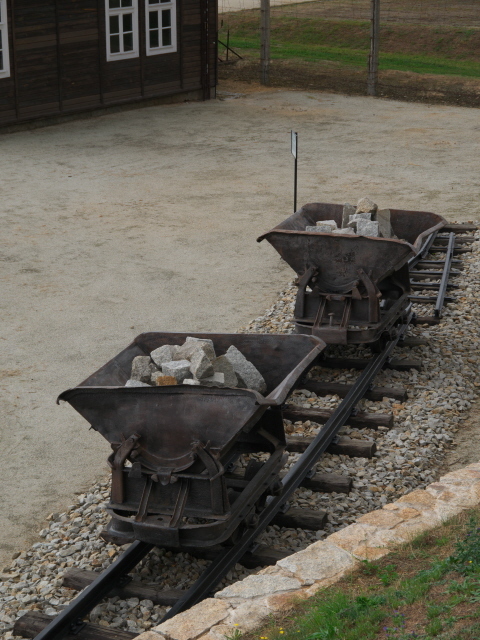 At first, the inmates were primarily involved in forced labour at the adjacent granite quarry – just like at Mauthausen, Natzweiler or Flossenbürg. In parallel to this they had also been forced to built the camp itself. But as the war dragged on, more and more work was diverted into other industries, in particular armaments production and related enterprises. Big-name companies such as Blaupunkt, Siemens, Krupp and IG Farben used slave workers from Gross-Rosen. Some even had workshops right at the camp itself (see below). Amongst the many sub-camps was also the “AL Riese”, where they had to work on the construction of a vast network of underground tunnels, which were either to serve as a new HQ for Hitler (cf. Wolfschanze) and/or (more likely) as underground arms production facilities (like at Mittelbau-Dora or Ebensee). Mortality rates at these grim sites were especially high. The daily regime at the main camp wasn't much better, though. It was the usual brutal mix of 12-hour shifts of hard labour on starvation rations, lack of medical care and sanitation plus constant mistreatment by the camp guards. Life expectancy for those who had to work at the quarry was an average of 5 weeks or so! At the peak of its operation in 1944 Gross-Rosen (and its numerous sub-camps) apparently held over 10% of the total concentration camp population in the Third Reich. Also in the second half of 1944 it saw a major expansion intended to house additional inmates moved here from Auschwitz – in anticipation of its evacuation as the Eastern Front was getting closer – and hence this extension was labelled “Auschwitz-Lager”. It was never finished, however. In early February 1945, Gross-Rosen itself was evacuated – and the SS sent some 45,000 camp inmates on death marches or deportation trains to other camps further west, such as Buchenwald, Dachau, Neuengamme and Bergen-Belsen. Shortly after, on 13 February 1945 the camp was liberated by Soviet troops. More than 120,000 prisoners passed through Gross-Rosen in total (and as many as ca. 13,000 through its various sub-camps). The death toll of the camp (and its evacuation) is estimated to have been over 40,000. After WWII Lower Silesia became part of Poland, and the grounds of the former camp of Gross-Rosen were handed over to the Polish authorities in order to set up a memorial. A mausoleum for the ashes of the victims was built, as well as a few monuments, and the first museum exhibition opened in 1958 in one of the wings of the gatehouse. In 1963 the site was entered in the State Register of Historic Monuments, making more funds available. 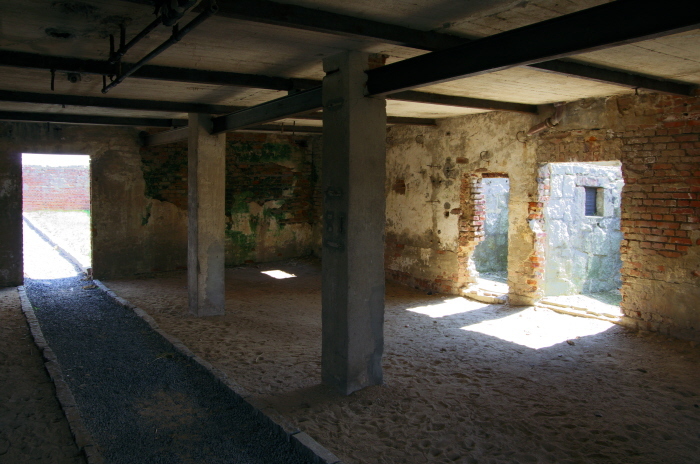 With the help of these, the SS casino/canteen was rebuilt (of which only the basement and arcades had survived the war) and more preservation and excavation work on the ground were undertaken. In 1983 the place was granted the status of 'State Museum' and more research and educational departments were established. Unfortunately the site lost the status of State Museum again in 1999. Since then it has been financed by the local government of Lower Silesia. This meant a more limited funding, and thus further progress in developing the site was slowed down. Yet, some significant expansions were still made possible since, most significantly amongst these is the incorporation in 2005 of the former quarry into the memorial's visitor circuit. 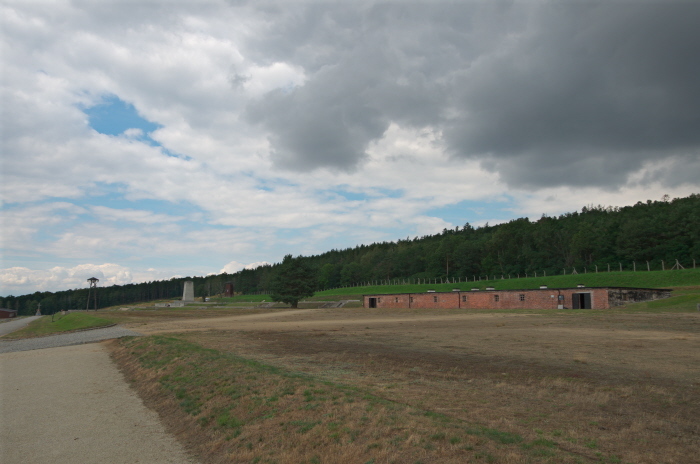 What there is to see: The whole complex consists of three rather distinct parts: A) the grounds of the former camp itself, B) the adjacent quarry, where inmates had to do forced labour, and C) the former SS casino/canteen, the only remaining (or rather: partly reconstructed) ancillary building outside the main camp's fence. There are a few general information plaques outside providing basic background info and an overview and map of the memorial complex. These plaques are all in Polish, German and English … though the translation quality is rather mediocre … so sometimes it's a bit difficult to decode what you read. The ex-SS casino houses the main exhibition of the memorial about the history of the camp itself. So it makes sense to start the proper visit with this. At the museum you can also opt for watching a film about the camp. Apparently it comes in two versions, one 30 minutes, the other 60 minutes long, Screenings cost 3 PLN or 5 PLN respectively. Given the limited time I had, I gave watching either film a miss and therefore cannot comment on its quality or exact content. A star exhibit in the exhibition upstairs includes a large scale model of what the camp would have looked like at its “peak” in 1944. It's made with much attention to detail, and worth studying for a bit. On the wall there's also a map of the whole concentration camp system in Poland. On display in the remainder of the exhibition are various photos, documents and artefacts, many of these collected from the camp's grounds, including the usual striped camp inmate clothes, wooden clogs, pieces of the camp's electric fence, spoons, brushes, scissors, and so on. The texts in this older exhibition are all in Polish only. However, at the entrance you can borrow a folder with English translations and more photos. The translation quality, alas, is pretty much on a par with that on the plaques outside, i.e. not very high. But it does suffice to fill you in on the info gaps you'd otherwise be left with. It's a rather old-fashioned kind of exhibition, without any modern multimedia-elements and such like. More emphasis is given to sombre artwork, such as the stained-glass windows or a large mural of wretched-looking camp inmates. Back outside you'll walk towards the most iconic element of the memorial complex: the gatehouse. This has the familiar “classic” form of a two-winged building with a gate in the centre and a watchtower-like structure at the top (just as at Sachsenhausen, Buchenwald, etc.) 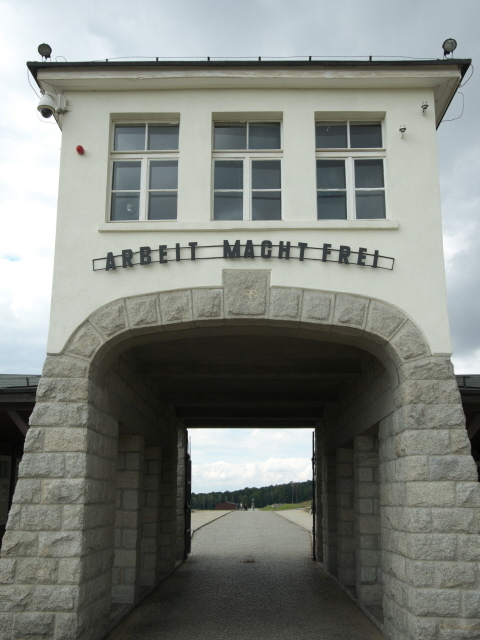 … and over the granite arch of the gate the familiar cynical slogan “Arbeit macht frei” ('works sets you free') is written. The two wings of the gatehouse are home to two different additional exhibitions. The left wing houses an exhibition entitled “Lost Humanity”, which is about the broader context of rising fascism and Nazism in Europe after WWI and up to and including WWII and the Holocaust. In this exhibition translations into four additional languages complement the original Polish, with French and Russian next to the usual German and English. The latter's translation quality is markedly better here than in the main exhibition or the panels outside! The other wing now houses a special exhibition about the “AL Riese” and the associated “Projekt Riese” of massive networks of underground tunnels in the mountains that the Nazis began to construct from 1943 to the north-west of Gross-Rosen, utilizing forced labour of camp inmates (see also background). This exhibition too comes with translations into the same four extra languages as its neighbour. From here you can either continue through the gate into the camp grounds proper or first do the detour to the quarry. The official circuit has this at the end, but I decided to head there first, given the weather was OK at that moment (whereas rain was forecast for later in the day). 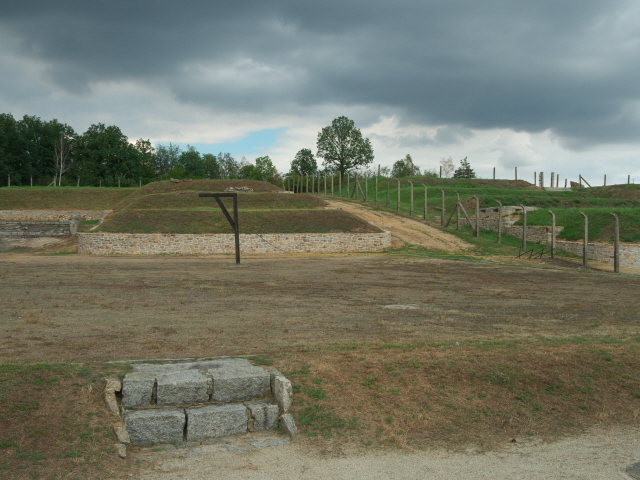 A path winds up a hillside to the right of the gatehouse and eventually leads to the edge of the giant pit that is the former granite quarry where camp inmates were worked to death, especially in the early phases of the camp. It's quite an impressive hole in the rocky ground – and much of the bottom is now filled with a greenish-blue lake, which would almost look idyllic if it wasn't for the very dark history of the place. You can also see a few old quarry works structures such as pylons for the quarry's overhead ropeway and rusty metal stairs leading down to the bottom (now the waterline). You cannot get close up to these, though (let alone use the stairs down). At the time of my visit even part of the plateau above the quarry was fenced off “temporarily”. But you could see some memorial stones inside that area … maybe it was just undergoing refurbishment at the time or new additions were being put in place. On the way back to the actual camp, a short walk to the left takes you to the former guard dog kennels of the SS. These are just ruins today, but somewhat ironically I noticed I was being watched by a current guard dog in its own kennel adjacent to the SS casino/museum building. Also a bit ironically, you can spot current mining activities going on at sites just on the other hillside beyond the old camp. Occasionally you could even hear the booms of blasting in these quarries. Back down by the gatehouse you can take a look at a memorial monument as well as a few quarry-associated relics such as tipping wagons on a short stretch of rails. Then you can start exploring the actual grounds of the camp. It's quite a large area, beginning with an open expanse that used to be the roll-call square – and also execution ground. The gallows is still standing. Most of the barracks and other buildings that made up the camp have disappeared, and the footprints of them are now simply marked by plain squares filled with gravel and with signs on the side indicating what the former function of the buildings in question used to be. 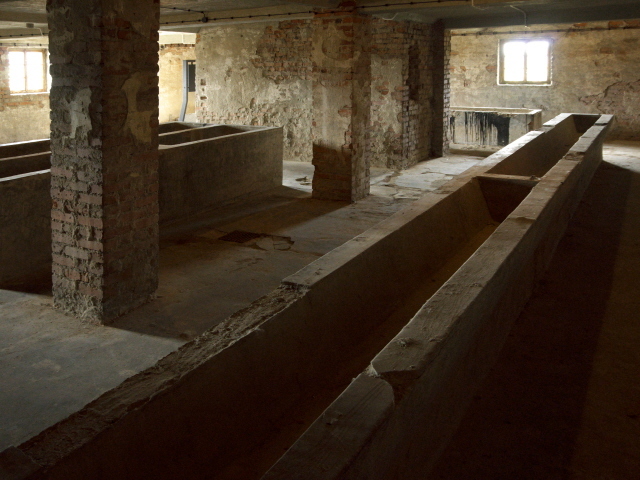 Amongst the few surviving/refurbished buildings are the brick structures of the camp's kitchen and bathrooms. Parts of these are accessible but there is very little commodification, just the odd old trilingual info panel. Inside the former camp's weaving mill, another brick structure, is yet another exhibition. This one is called “The Things, the Remembrance, the Sorrow that Remains ...” and it's primarily an archaeological section where bits and pieces excavated from around the camp are on display. This part is not regularly open and a memorial warden/guide has to unlock the door for you. It is usually part of guided tours. If you're not on a tour, like me when I visited, it's down to lucky timing whether or not you get a chance to see this. I was semi-lucky, and caught a few quick glimpses as the guide was just about to lock up again. 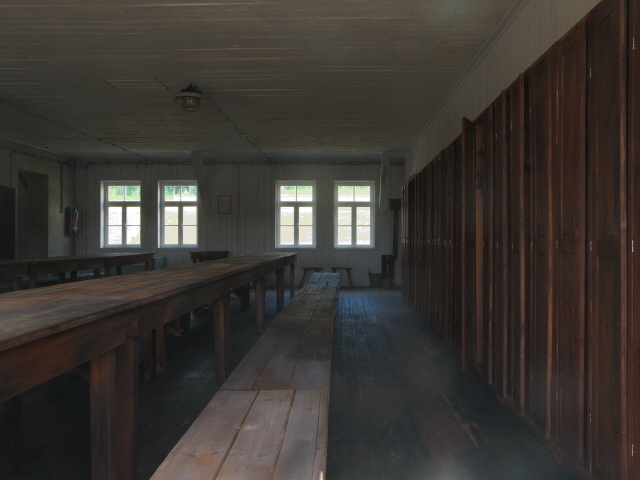 Also not regularly open for independent exploration (but you can get a good glimpse through the windows) is the reconstructed camp barrack, the “French Barrack”, with its wooden bunk beds, lockers and stove pipes. Only one wing of this wooden house is open to the public as it contains an auditorium as well as a series of more panels providing background information and stories from the camps (possibly a temporary exhibition), such as the role of sports (indeed! ), the different types of punishments meted out by the camp guards, and various other aspects. This exhibition is in four languages, with Russian forming the extra one to the usual Polish/German/English. At the far end of the complex you come to the camp fence and beyond lies what would have been the “Auschwitz-Lager” (see background). This is still overgrown and undeveloped, but you can just about still make out some foundations. 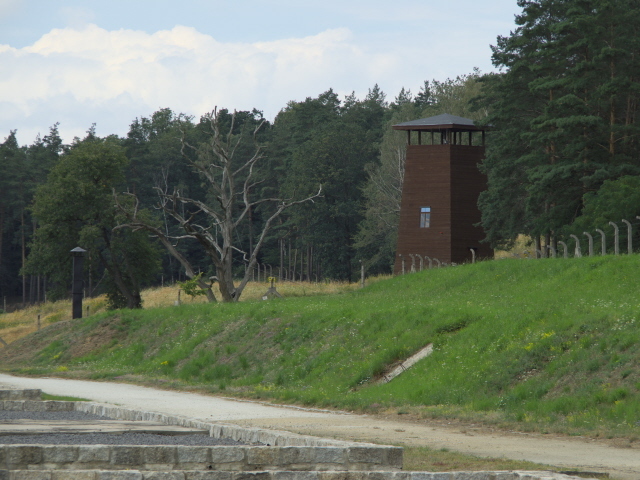 To the right of this part at the end of the fence stands a single, clearly recently reconstructed 30 foot (10 m) wooden watchtower – the inside is inaccessible, though, as the is door locked. The most prominent feature in this part of the former camp is the old main mausoleum-monument from 1953 with its eternal flame burning on a plinth in the centre, and plaques in five languages at the front. Either side of this, small signs along a stone wall commemorate Gross-Rosen's various sub-camps. Next to it is an area that a plaque informs used to be the execution ground (this one for non-public executions, unlike the roll-call square). And behind this is a single metal crematorium oven, just standing in the open. 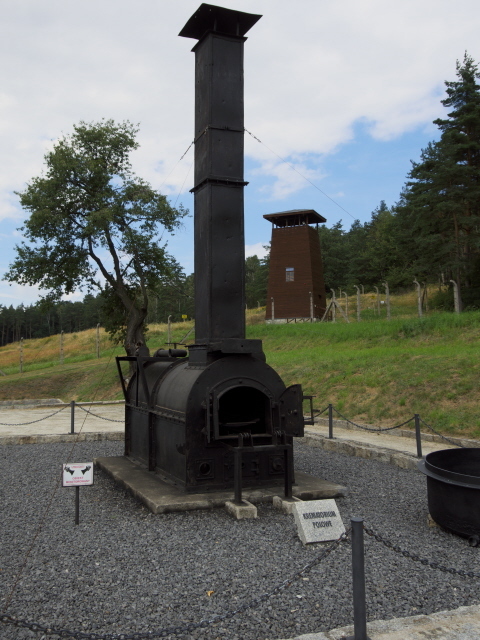 It's rather more representative of the genuine crematorium building (with three ovens) that the camp used to have. 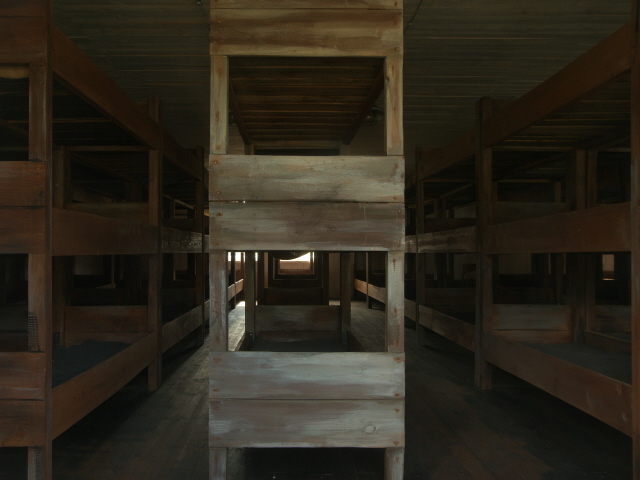 It was destroyed by the SS when the camp was evacuated. On the slope around a tree next to this site dozens of individual memorial plaques (mostly dedicated to certain individuals or small groups of victims) bring a more human element back into the equation. On the south-western edge of the camp a half-ruined building has been made accessible: the Blaupunkt workshop (i.e. where the electronics company of that name used camp inmates for slave labour). 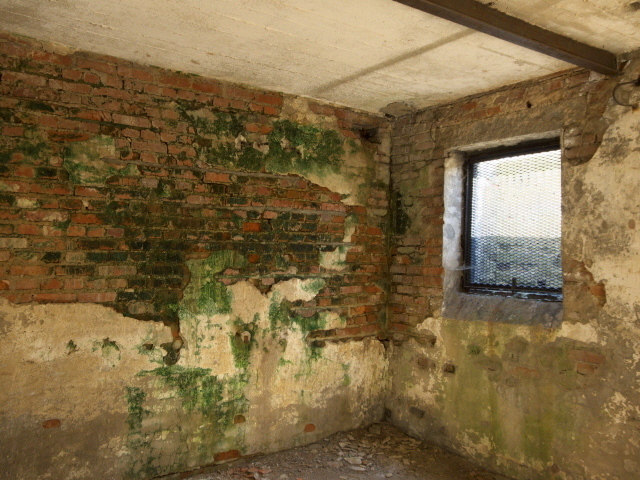 Inside on one of the walls there is a green coloration reminiscent of those associated with the use of Zyklon B … but there is no indication that such a connection might exist here. 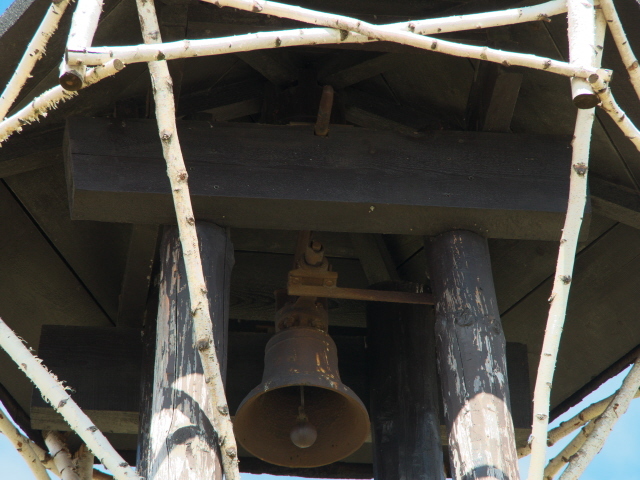 Moving back towards the gate, you also pass the former pool (empty now) and the tower with the original camp bell. Then it's back to the outer fence and out through the gatehouse. All in all, the memorial commodification at Gross-Rosen may suffer a bit from underfunding, especially if compared to the recently upgraded, hi-tech museum exhibitions added at the concentration camp memorials in Germany (especially Dachau, but now also Ravensbrück or Buchenwald), but it still compares rather more favourably to other sites within Poland such as Stutthof, Majdanek or Chelmno, while it will obviously always remain in the shadows of Auschwitz. If you wanted to rank it within the range of such sites, I'd say it's probably somewhere in the middle. The exhibitions at Gross-Rosen may be old-fashioned, but the newer additions at least are of a fairly good quality (the main historical exhibition could do with an update, though). The main thing here, however, is not so much the commodification and information, but the authenticity of the place itself. And that includes not only the iconic gatehouse and other camp structures but in particular also the original quarry. And for all that, a visit here can only be recommended. Location: roughly halfway between the Polish city of Wroclaw to the east and the border with the Czech Republic to the west, both ca. 40 miles (60 km) away. The nearest small town is Strzegom ca. 4 miles (7 km) to the south-east. The site of the former camp is south of the village of Rogoźnica. Access and costs: quite tricky unless going by car; free (except parking). Details: Getting to Gross-Rosen is easiest by means of your own vehicle (or hire car). Coming from Wroclaw take the A4 (E40) westward (towards Görlitz and Bautzen in Germany) and then the No 5 trunk road to Strzegom. From there head north-west on the 374 road towards Jawor (and Legnica). Coming from the other direction go Jawor from Legnica on the No. 3 road (E64). Once in the village of Rogoźnica, turn south on the street Ofiar Gross Rosen – it will be signposted from here. Once on that road you would hardly be able to miss the granite-marked entrance to the complex. There's a decent-sized car park right there. A (very) small parking fee of 3 PLN is levied (in 2016). It is not totally impossible to get to Gross-Rosen without a car, but it's a long and arduous journey. There are trains stopping at Rogoźnica e.g. from Legnica, which itself can be reached by train from Wroclaw. But connections are not especially frequent. And from the train station at Rogoźnica is still a rather long (at least 30 minutes) uphill walk to the actual camp location. You'd first have to make your way into the village via the church and eventually you'll find the signs pointing you in the right direction. You'll have to walk on the side of a road without any pavement, so watch out for traffic. The whole journey from Wroclaw can take 2-3 hours. So you'd have to start early. Opening times: daily from 8 a.m. to 7 p.m. in summer (May to September) but only to 4 p.m, in the winter season (October to April). Admission is free, but parking and the film screenings cost 3 PLN (30 minutes) or 5 PLN (60 minutes). Nominally, no under 14-year-old visitors are allowed. Guided tours can be arranged, also in English (or other foreign languages) by phoning ahead (check the gross-rosen.eu website), and cost 70 PLN per group of a maximum of 15 participants (120 PLN for larger groups of up to 40). In any case, visiting this site will require a lot of walking, so also bear in mind that the only toilet facilities available at the site are at the main museum building (the former SS canteen). The only catering available on site is a vending machine dispensing cold and hot drinks (including, apparently “tomato soup”, if you'd trust one coming from such a machine …). And since you shouldn't eat or drink while on the camp's premises, better come prepared and strengthen yourself sufficiently in advance. Time required: The officially advised length of a visit is two hours (without the film), but that may not be quite enough if you really want to study everything on offer. Covering the distances of this large area will take quite some time in any case. Combinations with other dark destinations: the most obvious combination within Lower Silesia, Poland, itself has to be Wroclaw (an hour's drive away), which isn't a prime dark-tourism destination, but has a few worthwhile darkish aspects … and is a great city to visit anyway. Some tour operators offer day return tours with a guide from Wroclaw. But Gross-Rosen is also within a car journey's reach from nearby south-eastern Germany, e.g. from Bautzen (ca. a 100 miles / 160 km to the west). The border with the Czech Republic is also not far away, but the parts that are of special interest to dark tourists are probably too far south (Prague is over 3 hours' drive away) to make a same-day return journey possible. Combinations with non-dark destinations: The classic combination here is Wroclaw (excursions to Gross-Rosen are almost always suggested to go from that city). And it's a wonderful city to explore for a few days, one of Poland's most pleasant, in my opinion! Otherwise see under Poland in general (or also Czech Republic and Germany).